Joe Maumkel is a living institution within St. Stanislaus High School. He is still serving St. Stanislaus High School since 1947. Popularly known as Dr. Joe and Infimary Joe. 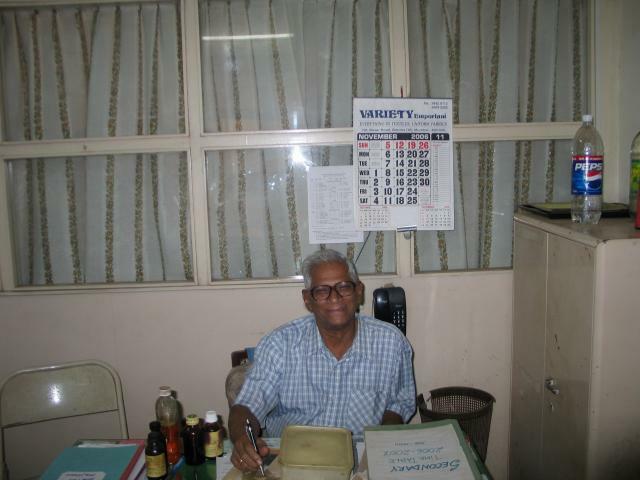 Notice the bottles of medicine on his table. Joe I still Remember you! Submitted by Homi Irani on July 10, 2009 - 5:59pm. Mid sixties , I came to class all dirty from playing during Recess and the teacher threw me out of class cause I was dirty as hell and Joe you took me to the grounds and hosed me down and gave me dry clothes ( Khaki shorts and a white shirt) and sent me back to class. What an outstanding career you had, what ever you did, you did out of love. God blessed you with wisdom . Thanks Joe for serving so many kids in your lifetime. For all of us , you will always be alive. God Bless and hope we all have your strength. Submitted by Capt. Leon Aranha on May 11, 2007 - 5:48pm. I remember Joe fondly, he was and I sure still is a lovely man. Great to see that u are still around Joe.